Thai Airways Flight 231 saw it’s last journey in April 1980. The aircraft lost altitude, stalled and crashed after entering a thunderstorm on approach to Bangkok, about 8 miles from Don Mueang International Airport (formerly: Bangkok International Airport). All 4 crew members, and 40 of the 49 passengers were killed. Flight 231 took off from Khon Kaen Airport (in Khon Kaen, Thailand) around 0550 hrs, headed to Don Mueang International Airport (in Bangkok, Thailand) ETA 0656 hrs. The flight operated on the route Bangkok – Khon Kaen – Udon – Nakhon Phanom – Udon – Khon Kaen – Bangkok. At 0559 hrs, after take-off from Khon Kaen Airport, the pilot reported to Bangkok Area Control Centre that he was climbing to 6,000 ft, ETA Korat at 0626 hrs, ETA Bangkok International Airport at 0656 hrs and requested ATC clearance to Bangkok International Airport via W6 – KT – W1 – BKK. Bangkok Area Control Centre cleared HS-THB to Bangkok International Airport via this route, to maintain FL 120 and asked the pilot to report when the aircraft reached FL 120. At 0614 hrs, the pilot reported that HS-THB reached FL 120. At 0626 hrs, the pilot reported that the aircraft was over KT. 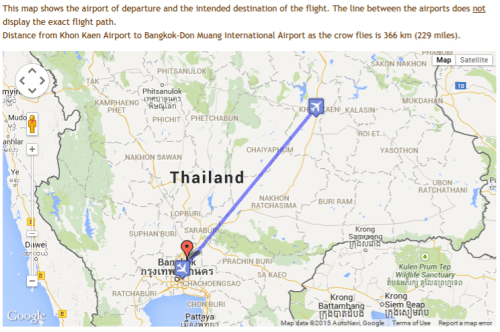 At 0627 hrs, Bangkok Area Control Centre informed the pilot that HS-THB was in radar contact, 5 miles northwest of KT. At 0642 hrs, Bangkok Area Control Centre cleared HS-THB to descend to 8 000 ft and informed the pilot that the altimeter setting was 1 008 mb. This was acknowledged by the pilot. At 0644 hrs, Bangkok Area Control Centre advised the pilot to contact Bangkok Approach control on 119.1 MHz. At 0644 hrs, the pilot contacted Bangkok Approach Control and reported that he was maintaining 8,000 ft. Bangkok Approach Control advised the pilot to descend to 6,000 ft and informed him that the altimeter setting was 1,008 mb. This was acknowledged by the pilot. At 0648 hrs, Bangkok Approach Control advised HS-THB to descend to 6,000 ft.
At 0651 hrs, Bangkok Approach Control advised HS-THB to descend to 1,500 ft.
At 0653 hrs, the pilot reported that HS-THB had reached 1,500 ft.
At 0654 hrs, Bangkok Approach Control informed the pilot that HS-THB was 7 miles from the Outer Marker and cleared the aircraft to make an ILS approach to runway 21R. This was Acknowledged by the pilot. At 0656 hrs, Bangkok Approach Control advised the pilot to contact Bangkok Tower on 18.1 MHZ, but no answer from the pilot was received. The aircraft operated in good weather conditions on both the outbound and return flight until, during approach to runway 21R, at an altitude of 1,500 ft near Bangkok International Airport, the aircraft entered a severe thunderstorm. Losing altitude, about a minute after entering the storm, a downdraft struck the plane which caused the nose to go up and the plane to stall. Many things in the passenger cabin fell to the floor. The rain was reported with hail. The passengers could see grey clouds through the windows, and the aircraft maintained altitude. About thirty seconds later, altitude was lost again, unfortunately more severely. The aircraft had gone into a nose dive, which the pilot tried to pull the aircraft out of. The Hawker then slightly banked to the right, and was almost out of the dive when the aircraft crashed into paddy field, skidding for 510 feet and breaking up at 0655 hrs, day time. Times reported are GMT. At 0656 hrs, Bangkok Approach Control instructed the pilot many times to contact Bangkok Tower on 118.1 MHZ, but no answer was received from the pilot. It is assumed that during that time the aircraft was pressed by a downdraft, lost altitude rapidly, and it had already crashed into the ground. The accident killed 44 of the passengers and crew, 9 people were injured in the crash. A review of the pilots’ medical records disclosed no evidence of physical problems which could have affected their judgement or performance. The pilot-in-command, aged 54, held an Airline Transport Pilot Licence valid until 2 August 1980 with an Instrument Rating and Aircraft Type Rating for the HS-748, Group 1. He had flown a total of 18 096:28 h, including 7 796:17 h in the HS-748 type, of which 193:17 h were flown in the last 90 days and 4:18 h in the last 24 h. He held a medical certificate valid until 2 August 1980 with the endorsement that he must wear corrective lenses while exercising the privilege of the certificate. The Co-pilot, aged 55, held an Airline Transport Pilot Licence valid until 3 July 1980 with an Instrument Rating and Aircraft Type Rating for the HS-748 Group 1. He had flown a total of 24 372:46 h, including 11 899:45 h in the HS-748 type, of which 229:00 h were flown in the last 90 days and 4:18 h in the last 24 h. He held a medical certificate valid until 3 July 1980 with the endorsement that he must wear corrective lenses while exercising the privilege of the certificate. The Bangkok Radar Approach Controller, aged 27, completed an Air Traffic Control Course from the Civil Aviation Training Centre – Thailand. She had performed air traffic control duties for 7 years. She held an Air Traffic Control Licence valid until 28 August 1980 with a Radar Approach Control Rating. The Tower Controller, aged 35, completed an Air Traffic Control Course at the Airman Technical Training School, RTAF. He had performed air traffic control duties for 16 years. He held an Air Traffic Control Licence valid until 19 October 1980 with an Aerodrome Control Rating. At 0705 hrs, Bangkok Tower alerted all units concerned in the vicinity of Bangkok International Airport. At 0726 hrs, a helicopter from the SAR unit of the Royal Thai Air Force took off. Bangkok Approach Control vectored the SAR helicopter to the position where HS-THB disappeared from the radar scope. At 0752 hrs, the helicopter sighted the wreckage of the aircraft. The rescue trucks and ambulances could not enter the crash site. Survivors had to be evacuated by one helicopter of the Royal Thai Air Force, and another helicopter of the Aviation Division, Ministry of Agricultural and Go-operative. They were evacuated from the crash site to the SAR unit, and then transported to the hospital by ambulances. The dead persons were lifted by a Royal Thai Air Force helicopter to a nearby road, and then transported by microbus of the charity foundation to the hospital for autopsy. The aircraft was destroyed. The fuselage was broken into three parts. The report stated that, in examining the aircraft wreckage and impact marks, the aircraft was banked slightly to the right at impact. A Hawker Siddeley HS 748 like the one that crashed. The plane ran forward after impact in the flight path direction about 510 ft. It is determined that the speed of the aircraft was high at impact. The plane did not stall. The first part was the nose section. It was broken at the leading edge of the wing, and folded to the starboard side. The lower portion of this part was damaged up to the cabin floor. The second part was from the leading edge to the trailing edge of the wing. It aligned to the aircraft skidding direction. Most of passenger seats in this part were torn from the floor. The third part was from the trailing edge of the wing to the end of the tail section. It aligned to the same direction with the second part. The vertical and the horizontal stabilizers were in their normal positions. They were slightly damaged. All passenger seats of this part were damaged. The cabin floor was in good condition. The starboard wing was torn from the fuselage and fell to the ground approximately 265 ft from the impact position. The wing was broken into two parts. The inner part which still contained the hot section of engine was damaged by fire. The outer part broke off and fell near the inner part. It lay in an upside down position. The fuel tank in the outer part was damaged. The starboard main landing gear assembly attached to the inner part was broken off. The engine minus the hot section was broken into many parts and fell 77 feet behind the trailing edge of the wing. The port wing, which remained attached to the second part of the fuselage, was broken. The flap was slightly damaged. The aileron was separated from the wing. There was a mark of fire along the wing span but there were more extensive fire marks in the engine area. The engine mount was broken. The engine was thrown about 200 ft from the aircraft. The port main landing gear was still attached to its position but folded rearward. 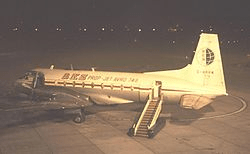 The Hawker Siddeley HS-748 Series II, Serial No. 1568, HS-THB belonged to Thai Airways, merging into Thai Airways International in 1988. The aircraft was manufactured by the Hawker Siddeley Aviation Ltd., England in 1964. 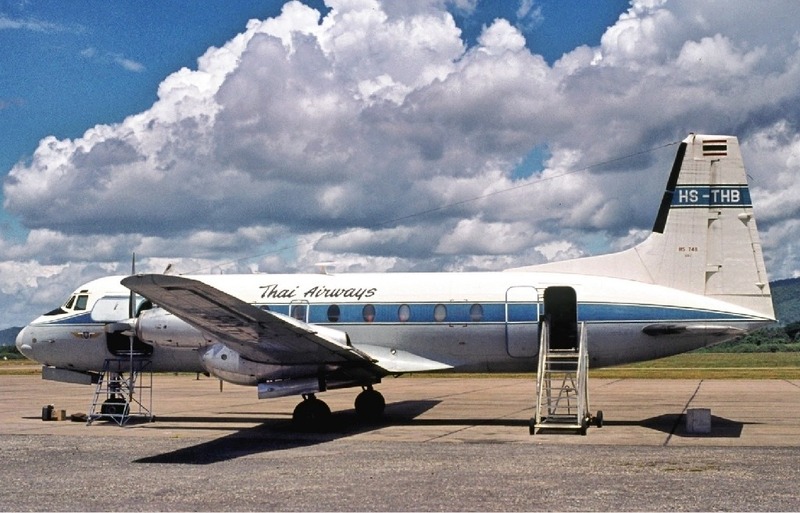 It had been in service with Thai Airways Company since November 27, 1964. It had accumulated a total time of 12 791:47 hrs. It was inspected when certificate of airworthiness No. 35/22 was issued by the Department of Aviation on August 26, 1979 valid until August 25, 1980. The aircraft was equipped with two Rolls Royce Dart MK532-22 turbo propeller engines. The port engine, serial No. 19320, accumulated a total time of 7 707:02 hrs since manufactured on May 14, 1971. It was removed from the port wing of HS-THF on April 20, 1978 for overhaul. After overhaul was completed, it was installed on the port wing of HSTHB on April 8, 1979. It had accumulated a total time of 1 516:54 hrs since last overhaul on April 8, 1979. No discrepancies were reported in the engine log book before this accident. The starboard engine, serial No. 570 was removed from the port wing of HS-THG on April 27, 1978 for overhaul. It had a total time of 6 220:35 hrs since manufactured on November 10, 1976. After overhaul was completed, it was installed on the starboard wing of HS-THB on April 12, 1979. It had accumulated a total time of 1 526:28 hrs since last overhaul on April 12, 1979. No discrepancies were reported in the engine log book before this accident. Thai Airways Company was the domestic flag carrier of Thailand. Its main base was the Domestic Terminal at Don Mueang International Airport: DMK (former name: Bangkok International Airport: BKK). Its head office was located in Pom Prap Sattru Phai, Bangkok. 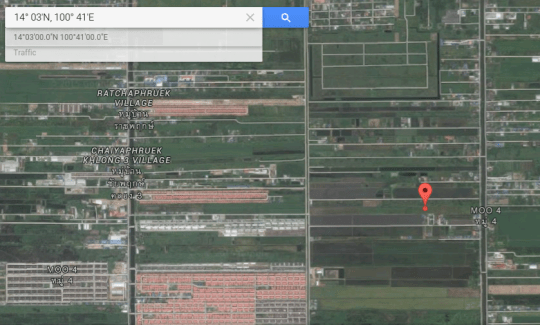 The plane crashed into the ground approximately 8 NM northeast of Bangkok International Airport (Lat 14° 03’N, Long 100° 41’E). The cause of the accident was that the pilot directed the aircraft into a thunderstorm, in an early dissipating stage. The aircraft was severely affected by a downdraft and lost altitude rapidly. At that time the altitude of the aircraft was only 1,500 ft and the pilot could not maintain altitude of the aircraft. The plane crashed into the ground, and ran forward. 1. During flight prior to the accident, the pilot did not tune his radio to the ATIS frequency, so he did not receive the special weather report (SPECI) broadcast four minutes before the accident advising that there was a thunderstorm in the area he would soon encounter. 2. The pilot did not make use of airborne weather radar. 3. While the pilot was approaching at high altitude, he could see the thunderstorm, but it was not in his flight path to Bangkok International Airport. When the pilot was descending in compliance with Bangkok Approach Control instruction, he was not aware that the rain area which he was entering was a thunderstorm which was moving and developing severely. The thunderstorm which had developed to the severe stage was moving and intercepted the aircraft. Follow mayday365 for complete aviation disaster history every day!